We are dedicated to doing PR and outreach that creates maximum exposure and results that will benefit all partners and participants. Year one, we had a commercial running in constant rotation at the Poughkeespie Galleria Mall! Many thanks to ABC GO DIGITAL for helping us reach thousands of people about Hudson Valley Vegfest! We print and distribute hundreds of posters and thousands of rack cards - months prior to our event weekend! Head (rescued) Office Chickens Blanche and Zoltan (at The Institute for Animal Happiness) personally approved the design. We love seeing these promote the event around the Hudson Valley! Zoltan, another rescue at The Institute, admiring the printing quality of 2018 Posters and Rack cards printed by VEGAN PRINTERS! Blanche, a rescued "Polish Lace" hen, making sure the new rack cards are in good pecking order! 2018’s beautiful full color poster! We are getting ourselves listed everywhere! From blogs to local sites like Brewster's Hamlet Hub and Hudson Valley Go! But being the ONLY vegan event on the I Love NY Official Tourism Website is incredible and gives us the potential to reach untold numbers of visitors to the area in the time frame of our festival. 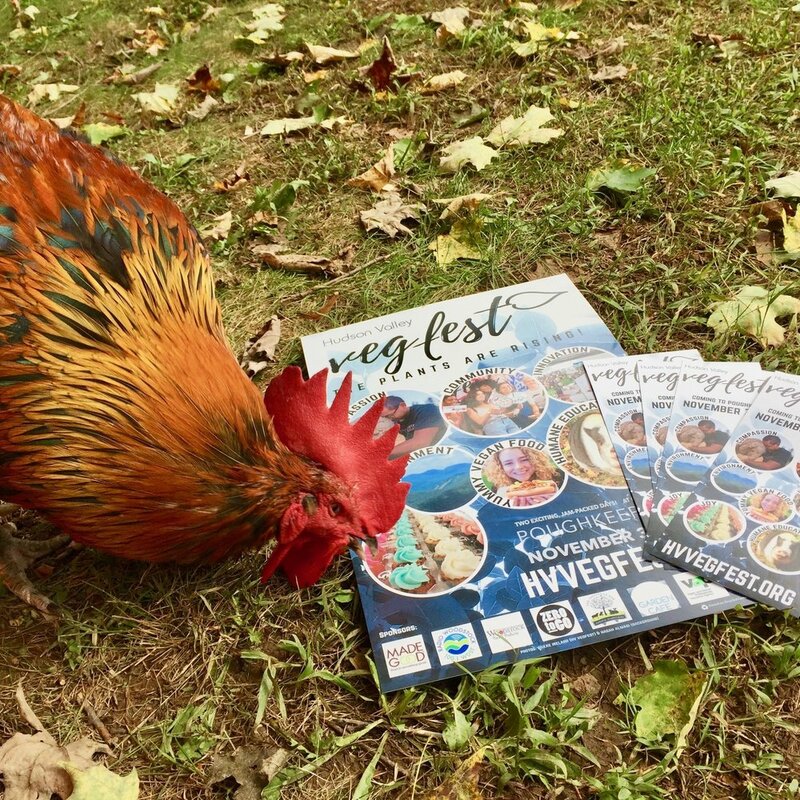 Poughkeepsie Journal, Hudson Valley Magazine Online, Chronogram, A Little Beacon Blog, and HV Eats editorial articles, spreading word about the event and singling us out among other long-established food festivals in the region (and we are the only one that is vegan, health-focused, and about compassion for animals too!) We also were the FEATURE COVER STORY of the Fall issue of Living and Being Magazine!!! Radio interviews on WDST, iHeart Radio's Dutchess County Chamber of Commerce Broadcast, and the HV Eats podcast have also aired. Thanks to our incredible media sponsors, WDST RADIO WOODSTOCK 100.1 and WAMC NORTHEAST PUBLIC RADIO and wonderful magazines and newspapers like THRIVE MAGAZINE and THE TASTE GUIDE (ULSTER PUBLISHING). We are truly excited to have the support of Dutchess Tourism !